Hi Community! We didn’t want to leave this year without writing one final article for all the readers out there. This year has been an amazing learning curve for us and we appreciate all the support and questions that have come our way. We thought we’d spend our final article doing a quick recap of the fresh rookies running around at the moment but then compile the draft list of rookies to watch out for next year. Finally, we wanted to see how our advice held up from the start of the season as we rate our top 10 selections in each line. So without further ado, let’s get into it. Brandon Starcevich (Mid/Fwd $235,000 BE 43) – It’s hard not to be impressed with how fast Starcevich is but unfortunately he hasn’t been able to impress us on the scoreboard. Got his fair share of time in the midfield but still only managed 25 points. Cameron Polson (Fwd $202,000 BE 22) – We know, we know he’s not a fresh face but at the end of the day he’s still sitting around 200k so it’s worth a mention for those who need someone to get them through the last two weeks. You’d want more than the five touches and 19 points that were delivered against Fremantle though. Samuel Switkowski (Fwd $181,000 BE 13) – Played up forward, like he has been in the reserves, and actually looked very promising. Too many injuries at the Dockers for him not to keep playing. 13 Disposals and 47 points in his first showing. Ryan Abbot (Ruc $206,000 BE -18) Was very unlucky to be dropped this week but with the injury to Rhys Stanley he should be back. Was in all the right places in his first game two weeks back. 7 tackles and the 27 hitouts wasn’t actually the shining light, it was his ability to go forward and kick two majors that had us most excited. We wish he didn’t get another run for the sake of our teams next year but could at least provide some coverage if the question marks over Max Gawns fitness remain. Connor Nash (Def $175,000 BE 20) – Didn’t actually notice Nash running around the park despite watching the entire game. Provided good pressure for his five tackles but the looming return of Grant Birchall probably isn’t going to help his cause going forward. Hopefully will give us one or two more games for the backline. Marc Pittonet (Ruc $212,000 BE 13) – Was really surprised when McEvoy went down that it took a late withdrawal for Pittonet to get a game. Abbot is a far better option if he is named this week but Pittonet still started as the first choice ruck in the game which probably shows he has less flexibility than Ceglar. Had 25 hitouts to help him to 59 points. Lewis Pierce (Ruc $2o2,000 BE -12) – It’s hard as a St Kilda fan to get excited about much at the moment but watching Pierce really dig in against a tough Essendon outfit (pre-injuries) was great to see. He slowed down as the game went on, but still finished with 18 possession and 27 hitouts for his 85 points. Ben Paton (Def $185,000 BE 22) – Really only got a game due to the nature of where St Kilda is at and looked a bit out of place because of that. Kicked a nice goal and finished with nine disposals but only 37 points wasn’t anything to write home about. We have compiled a list of players to start your 2019 watchlist. Now some of these players have played this year but in only limited games (less than 2). We hope that these players price next year reflect their limited game time but at worst there’s some key names who didn’t get a game this year for X and Y reasons. The reserve level average of the players is shown next to them. Do with this list what you want, and we’ll definitely be staying in touch as there will no doubt be additions to it over the pre-season. We see this list as a good starting point to get you through those early pre-season articles as any buzz around these players will only be a good thing for our starting teams in 2019. As much as we have always kept a close eye on the juniors over the past few years, this year really was our first chance to spread our knowledge. Once again, the community has made it a lot easier and we thank you for that. Following on from Jeppa was never going to be an easy task so we thought we’d reflect on how we went and pass on some key lessons learnt from it all. The following is the top ten list that we presented at the start of the year for each of the respective lines. We were doing so well until we got to pick 8 and from there it went down hill. Hopefully you didn’t take anyone that low down on our list. Nick Coffield was rated too highly and it’s interesting that Hunter Clark ended up being the better pick of the two early draftees that went to St Kilda. What we learnt from this is that the round 1 team can say it all about how AFL ready a player really is. It took until Round 3 for him to get his chance and although he looked good early, from that point a rookie is always behind the eight ball to stay in the team. Jack Henry and Brody Mihocek are the key names that we missed out but other than that we felt we had a pretty good handle on the defenders throughout the process. It’s always hard to rate scoring potential over job security but if you started with one or more of Murray/Doedee/Finlayson and had Pearce/Naughton there for security reasons then you would’ve been off to a good start. The key one missed was Jordan Cunico from Geelong, but outside of that we are pretty happy with the players presented. Majority of them (other than LDU) played early and pumped out the stock standard scores you can expect from rookies. Jacobs and Holman were stars at the start of the season but it wasn’t until after the bye that it became obvious, our number 1 pick should’ve been Tim Kelly. It speaks volumes to the type of season Kelly has had verse anything else though. Other players that did well during the year were Ed Phillips and Paul Ahern. The key thing to note here is that these players, Kelly, Holman and Bailey Banfield were mature age players coming through the ranks. Any of these type of players that have strong preseasons and picked early on have proven year after year that they will be strong performers for their respective sides. We will be sure to keep an extra close eye on the next batch of mature age recruits coming through. This was easily our worst performing line, but in our defence, injury had a lot to do with that. Stephenson turned out to be much more of a star than we anticipated. The same can be said for Tim English early on. Key names missed were Matt Guelfi, Ben Ronke and Billy Gowers. Guelfi and Ronke were left out due to us thinking the teams they player for would mean they would struggle to play a game. This turned out not to be the case, which shows no matter how solid a 22 looks for a team, if a rookie is good enough they will still get a game. A key takeaway and lesson learnt on our end for sure. All other forwards that came through gave us more than enough warning with their reserve level form. We just couldn’t be happier with how Fritsch ended up patching together such a solid season. Another example of that mature age recruit coming through for his team! Enough from us though, we’d love to hear from all you coaches out there in the comments below. Who was your rookie success story from the year? Have you held any of your rookies all year until this point? Which rookies were your unexpected heroes when other players were missing? Also, and perhaps most importantly, It’s time to vote for this season’s best Fantasy rookie. Select the ‘junior’ that you believe was the most valuable throughout the season. Consider scoring, games played, consistency, and the like. Who is the Junior of the Year – 2017? Who was the Cash Cow Rookie of the year in 2018? FOLLOW US ON TWITTER: Make sure to follow us on Twitter @TheMilkmenDT. 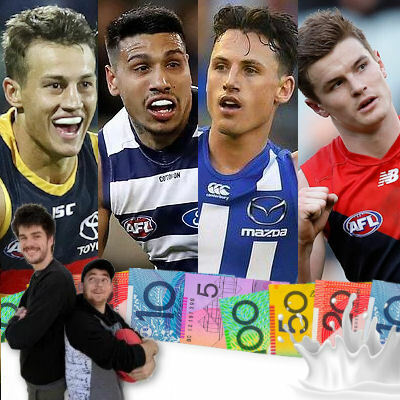 We’ll be sure to keep you updated in the lead up to the draft and the weeks that follow on how the cash cow class of 2019 is shaping up. We look forward to a big year ahead next year helping out all coaches on the website. Thanks The Milkmen for your valuable information and insights re rookies. Your articles throughout the season have certainly helped me! Great job lads. I thought Jeppa ‘wifey’ Juniors would be hard to replace but you guys were even better. Speaking of wifey when the hell did it become acceptable to use that term in private let alone public!? Is it any wonder men are becoming more and more like sissys. big thanks from me – very knowledgeable and clear writing. For all the time and effort you guys have put in to help us guys, thank you. Voting not working but Telly by a mile. Well gents, I’m still alive in all leagues I’m in – I can safely guarantee that would not be the case if it weren’t for your knowledge and dedication. Cheers gents!